Creativity is about capturing those moments that make life worth living. Legendary psychologist Mihaly Csikszentmihalyi reveals what leads to these moments - be it the excitement of the artist at the easel or the scientist in the lab - so that this knowledge can be used to enrich people's lives. 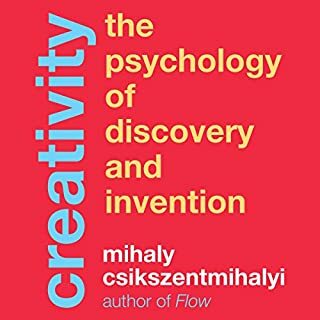 Drawing on nearly 100 interviews with exceptional people, from biologists and physicists, to politicians and business leaders, to poets and artists, as well as his 30 years of research, Csikszentmihalyi uses his famous flow theory to explore the creative process. 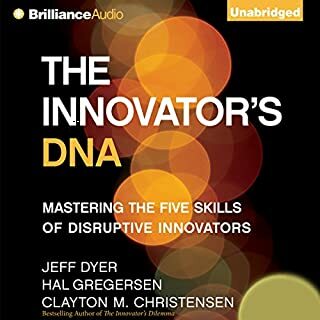 In The Innovator’s DNA, authors Jeff Dyer, Hal Gregersen, and bestselling author Clayton M. Christensen ( The Innovator’s Dilemma, The Innovator’s Solution) build on what we know about disruptive innovation to show how individuals can develop the skills necessary to move progressively from idea to impact. By identifying behaviors of the world’s best innovators the authors outline five discovery skills that distinguish innovative entrepreneurs and executives from ordinary managers. Starts slowly and then... it pops! There have been many books - on a large and small scale - about Steve Jobs, one of the most famous CEOs in history. But this book is different from all the others. Becoming Steve Jobs takes on and breaks down the existing myth and stereotypes about Steve Jobs. The conventional, one-dimensional view of Jobs is that he was half genius, half jerk from youth, an irascible and selfish leader who slighted friends and family alike. Every Sunday, as a kid, Catmull watched on TV The Wonderful World of Disney, where Disney explained how they made their animations and incorporated technological breakthroughs into their work. One day, Catmull had a life-changing realization: A good animation was measured by whether or not the character on the screen made you believe it was a thinking being. He decided he wanted to become an animator and create emotional characters. Learn to live your life with compassion, integrity and authenticity. Ikigai is a Japanese phenomenon commonly understood as "your reason to get up in the morning". Ikigai can be small moments: the morning air, a cup of coffee, a compliment. It can also be deep convictions: a fulfilling job, lasting friendships, balanced health. Whether big or small, your ikigai is the path to success and happiness in your own life. Author Ken Mogi introduces five pillars of ikigai to help you make the most of each day and become your most authentic self. SOMETHING I'VE HAD ALL ALONG AND NEVER REALISED. 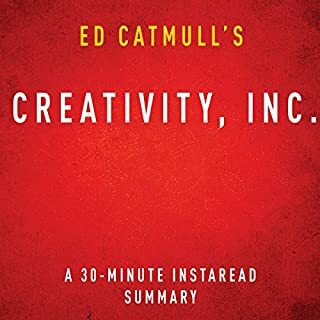 From Ed Catmull, co-founder (with Steve Jobs and John Lasseter) of Pixar Animation Studios, comes an incisive book about creativity in business - sure to appeal to readers of Daniel Pink, Tom Peters, and Chip and Dan Heath. For nearly 20 years, Pixar has dominated the world of animation, producing such beloved films as the Toy Story trilogy, Monsters, Inc., Finding Nemo, The Incredibles, Up, and WALL-E, which have gone on to set box-office records and garner 30 Academy Awards. The joyousness of the storytelling, the inventive plots, the emotional authenticity: In some ways, Pixar movies are an object lesson in what creativity really is. 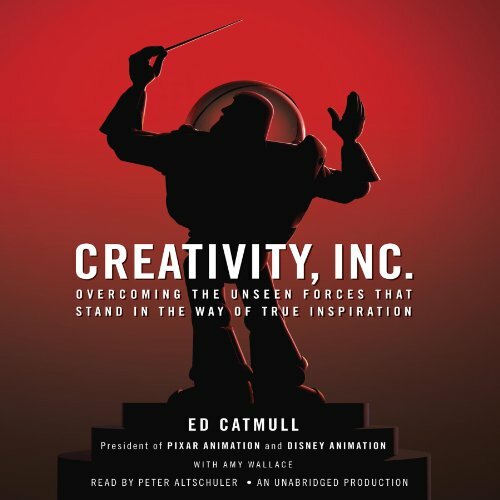 Here, in this book, Catmull reveals the ideals and techniques that have made Pixar so widely admired - and so profitable. Give a good idea to a mediocre team, and they will screw it up. But give a mediocre idea to a great team, and they will either fix it or come up with something better. If you don’t strive to uncover what is unseen and understand its nature, you will be ill prepared to lead. It’s not the manager’s job to prevent risks. It’s the manager’s job to make it safe for others to take them. The cost of preventing errors is often far greater than the cost of fixing them. A company’s communication structure should not mirror its organizational structure. Everybody should be able to talk to anybody. Do not assume that general agreement will lead to change - it takes substantial energy to move a group, even when all are on board. What does Peter Altschuler bring to the story that you wouldn’t experience if you just read the book? Many criticized Peter Altshuer's performance. Don't be put off by such comments. I discovered that by just speading up 1.25x, the pace and expressiveness of the narration improve a lot, and the listening experience becomes a great one. This book is unquestionably worth a listen, doesn't matter if your a creative type or just a regular person it's great advice all around. Peter Altschuler reads the book well, his older voice really makes it feel like it's Ed telling the story himself. Was Creativity, Inc. worth the listening time? Creativity Inc is definitely worth the listen time, kept me sucked in the whole time. This is the however part... Ed Catmul talks about how important his employee's and culture of cander and honesty he's built at Pixar, but in light of the discover that Ed was part of a wage fixing scheme dating all the way back to Pixar's founding in the 1980's gaining different studios in on the agreement along the way while also being completely unapologetic about it when news broke about their Illegal actions to suppress animators wages. everything he talks about in this book sort of rings hallow, he talks a lot about how much he cares but I can't help but call him a liar. Bought the instant I saw it. Ed Catmull? Done! I bought this book within 2 seconds of seeing the title. I'm nearly done with the book. Really fun to get the pixar story from Catmull's side. (a major inventor of 3D graphics technology since the 70's) It reminds me of listening to The Woz autobiography: there's parallels (Both were tech partners with Steve Jobs). I've read many books that get into the pixar story, and I have my own personal history with the people from this company and era(s). 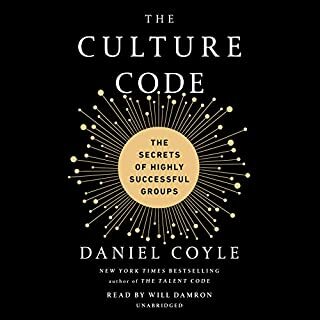 Enjoying this perspective on company building, team leadership, balancing people and constraints, unique aspects of creative teams, amazing stories, and much more. Creativity Inc is a must read. It presents the details needed to run a company that can thrive in a turbulent world. Read only if you are bold enough to change. Management is no longer valid. Replace it with a new arenas based on cognitive behavioral science, intuition, and human ways of working. What made the experience of listening to Creativity, Inc. the most enjoyable? There were parts of this book that didn't make sense to me when I first listened... but they stuck. And I think I understand them better over time. It's the kind of book that takes a bit to settle in, for the lessons to really register. To me, those are the good ones. What was one of the most memorable moments of Creativity, Inc.? "Your model of reality is not reality itself." This was frustrating when I first heard it. What are supposed to use if our own worldview models are inadequate? I believe I understand now from this that models of the world are simply tools. Use them when they're helpful. Discard them when they aren't. Catmull teaches lessons that will prove invaluable to anybody who works in a creative space. You won't find his perspective elsewhere. What did you love best about Creativity, Inc.? An in-depth look at the history of Pixar, Steve Jobs, and it's acquisition by Disney. 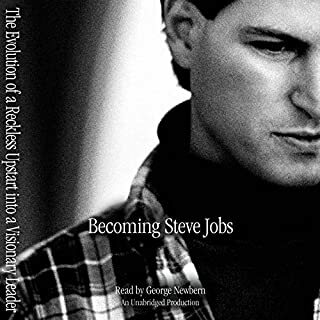 The author takes you through Pixar's humble beginnings, the impact Steve Jobs had on the firm when he bought it and took it public, the various ways that they created a culture of excellence and creativity. It's interesting to hear how they created Toy Story, Ratitue(sp), Finding Nemo, etc. If you love creativity and entertainment it will open your mind. The author takes you through the many steps involved in the creative process of writing a script. One thing that stood out to me was the finding that 1st graders are more creative than 5th graders. That is a telling finding. The book will help anyone as it teaches you about how to live a more creative life. What would have made Creativity, Inc. better? I read the book, wanted to go through it again, so got the audiobook. The narrator used for this amazing book casts an elderly, somber tone to an amazingly uplifting and inspiring story. Reading it, not the audiobook. Who would you have cast as narrator instead of Peter Altschuler? ANYONE ELSE... Eagleman fron Incognito, or the Freakanomics narrators are great and keep the listner moving forward, not lost in painfully slow and silly expressions. 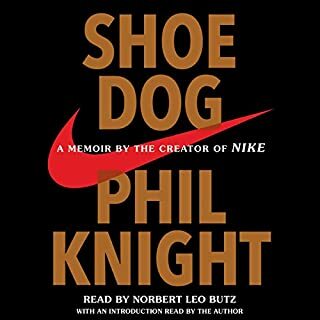 Love reading it, audiobook is painful to drag through. I enjoyed the story. I loved the story. Several great insights and lessons to be applied in my everyday role. Executing on a Brain Trust team will be challenging...but it is spot on. I watch our team behavior with a new perspective. More than once I've found myself picking a chair against the back wall to shake up the rigid seating patterns. Love it. What didn’t you like about Peter Altschuler’s performance? Peter's style, interests and understanding of the subject matter were clearly a total mismatch for this content. Peter may be a great "performer" and may the right style for a good drama, but not a business book. Almost impossible to listen to. What disappointed you about Creativity, Inc.? The worst delivery imaginable. What a total disappointment. Such a great story, and such a terrible performance. Even a few minutes is difficult to get through, the voiceover is so affected and exaggerated and distracting. Awful stuff. Would you be willing to try another one of Peter Altschuler’s performances? Buy the digital or paper book, skip the audio edition.